It begins in 2002, the year Jeremiah’s brother, Josh, died from a drug overdose at 19. Amidst the loss and grief, Wes and Jer found solace in music, writing songs and playing gigs around New York. After battling the city’s cutthroat music scene and impossibly high cost of living, the two decided to expand their horizons. They packed everything they owned—nothing more than a couple suitcases of clothes and a trailer full of musical instruments—and headed for Denver, Colorado. It was less a pilgrimage than act of stubborn hopefulness. The first thing they did in Denver was place a Craigslist ad for a cellist, and the first person to respond was Neyla Pekarek, a classically trained Denver native. As a trio, they began playing at the Meadowlark, a gritty basement club where the city’s most talented songwriters gathered every Tuesday for an open mic and dollar PBRs. Neyla softened Wes and Jer’s rough edges while expanding her skills to mandolin and piano. 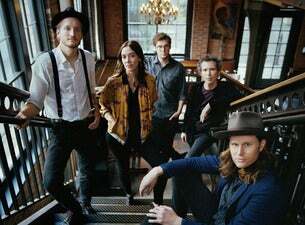 And so The Lumineers sound took shape; an amalgam of heart-swelling stomp-and-clap acoustic rock, classic pop, and front-porch folk. In 2011, an eponymous, self-recorded EP led to a self-booked tour, and before long The Lumineers started attracting devout fans, first across the Western US, then back in their old East Coast stomp-ing grounds. Young, old and in-between, they’re drawn by songs like “Ho Hey” and “Stubborn Love,” Americana-inflected barnburners in the vein of the Avett Brothers and Mumford & Sons. They’re drawn by songs like “Slow it Down” and “Dead Sea,” slow, sultry ballads that suggest the raw revelations of Jeff Buckley and Ryan Adams. They’re drawn by the live Lumineers experience—a coming-together in musical solidarity against isolation, adversity, and despair. Born out of sorrow, powered by passion, ripened by hard work, The Lumineers have found their sound when the world needs it most.